Looking for private in-home or in-studio Trumpet lessons? Our Angelus Oaks teachers are ready to get you started. Find your teacher today! I equally cover fundamentals, technique, tone production, classical, jazz and anything else the student might be interested in. Phil Norris has been teaching trumpet since 1983. He teaches the physical side of the trumpet as well as the musical side. The trumpet, being one of the most physically grueling instruments, demands this. 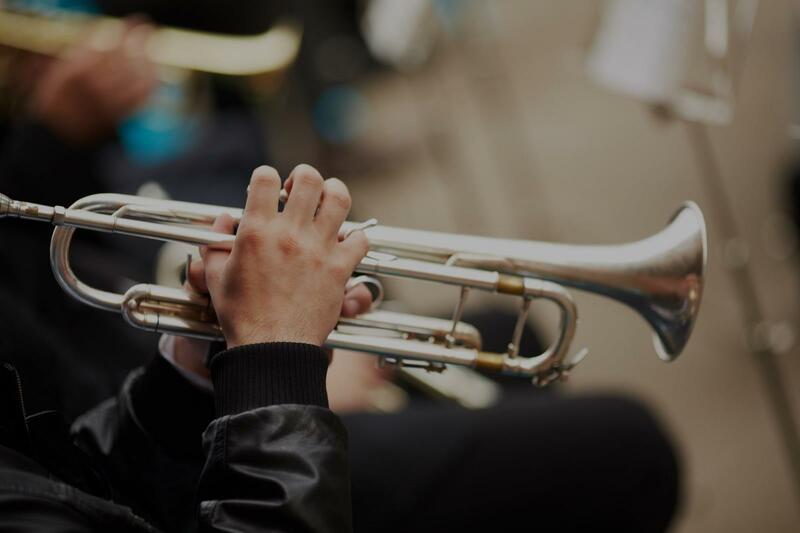 He gives a customized routine for the student to do at home and he also helps with those who are having embouchure problems, whether they’ve developed a bad habit or have had to deal with braces. On the musical side, Phil teaches jazz improv, big band lead, how to play in a rock horn section, and even classical style. Of course reading music and helping with the student’s school material is also focused on. I specialize in embouchure development and the physical side of playing a trumpet first. Of course I teach music too and help with a students' school band music,etc. My son has been a trumpet student with Phil Norris for the past 3 years. I am very pleased with the instruction. Phil continues to work with Alex to improve his embouchure through various lip exercises and slurs. Also, works on diaphragm strength through various exercise. Alex is one of the top trumpet players at his school as a freshman. His range and tone has dramatically improved since working with Phil. Phil is fun and engaging as well. I highly recommend Phil to anyone looking for a competent and skilled music instructor. and played alongside him on a few gigs. Phil is the real deal. He can scream high notes, low notes, and everything in between. He can help you get results. I have been taking lessons from Phil for almost two years. He is very patient making the student feel comfortable. He is not harshly critical. Just gives good feedback. He is a master of appropriately challenging the student. At times he will play along with me which I find helpful. If I miss a lesson he gives me make up lessons. His rates are more than fair. I highly recommend Phil for trumpet instruction. The lessons would be concentrated around student needs. Focusing on pieces of music that will reflect the student taste. Starting from the different pieces we'll approach new techniques or practicing methods. Also the lesson will be used to wide the student's knowledge of the instrument and music presenting new genres, artists etc. Cosimo Boni is a trumpet player from Florence, Italy. He studied and performed with world known musicians like: Joe Lovano, Terence Blanchard, Dream Theater, John Patitucci, Danilo Perez and many others. He started playing trumpet at the age of 11. He is graduated with a Master from Berklee College of Music in Boston, USA where he moved in 2012. He has been teaching trumpet, music theory, ear training and improvisation techniques since 2010. His teaching beliefs are that everybody is capable of being a great musician. His lessons are tailored to the students need, learning pace and taste so that the learning experience can be always fun and engaging. Cosimo is one of the most thoughtful and patient teachers I’ve had. He was always prepared and envolved in my debelopment. I can say without a doubt he is one of the best teachers around. I was moved by Cosimo’s lesson. His knowledge and musicality are beyond. I recommend Cosimo, he makes the lesson very interesting and fun. Also check his music out, his quintet sounds very good. I actually love the sound of his alto player a lot. Cosimo was a great teacher. His lesson were fun, clear and really effective. He was always helpful and willing to help me learn what I like. Lessons with Mitchell are all about you! He takes great interest in the specific needs of each student, creating materials and exercises geared toward reaching those goals. Lesson time is focused around making a whole musician by not only working on the instrument, but looking at ear training, music theory, and much more. A life long educator, I have been teaching trumpet students of all ages for 10 years! I love to make exercises that actually apply to what needs to be worked on, in addition to the books we use. I believe in a well rounded musician, incorporating aural training and music theory practice into our lessons. I am a musician with expierence playing French Horn with professional orchestras and chamber groups. I have spent 5 years teaching privately and held positions teaching in the public schools. Through my public school experience I have had the opportunity to give many trumpet lessons. In my lessons we not only focus on having good sound, technique, and musicianship but also having fun while playing the instrument! It is my goal to bring the students personality out through their music. Hello! Let me start by thanking you for your interest in private horn lessons! They are a great way to express yourself or make band class at school even more fun by staying ahead of the curve. s quintet fellowship at The University of Cincinnati College-Conservatory of Music where I continue to grow as musician under the guidance of world-renown hornist and pedagogue Denise Tryon. During my performance career I spent my spare time teaching students! From 2014 to now I have taught many private students some of which have performed with honor ensembles. I also taught in the Florida Public School system in 2018 as a brass clinician and orchestra director. It is extremely important for a teacher to have both playing and instructional experience which is a quality I take pride in. Mr. Phelps is an outstanding instructor! He worked with my large group, small group, and private lessons students. As a band director, I truly appreciated his professionalism and demeanor with all of my students of all ages and levels - very supportive and very encouraging. His lesson are high-energy and up-tempo, the kids loved it! Chris is an excellent choice for lessons. I highly recommend him! Chris was a great teacher and help to our daughter. He was also very flexible with our schedule and often helped us move the time to fit perfectly...on Sunday no less! Within a short time both her band leader and us could hear the difference in her performance. Super nice nice guy too and that’s coming from a Gators fan (if you follow college football you will understand this). Best of luck up there Chris! Mr. Phelps is a wonderful educator! My middle school band students were in awe of his expertise AND had a great time learning from him. He is a wealth of knowledge and has an excellent understanding of pacing material correctly for the level of student he is working with. My kids were engaged and excited without being overwhelmed. I would absolutely hire him again. I have had the privilege of teaching piano and trumpet throughout Southeast Wisconsin and Northern Illinois for the past 12 years. In order to maximize convenience for both students and parents, I offer lessons in the comfort of your own home throughout Lake Geneva, Burlington, Elkhorn, Delavan, Genoa City and the surrounding areas. Many of my former students have gone on to become composers, performers and active instructors. Whether instructing piano or trumpet, lessons are always interactive, educational, memorable, and most of all fun! Once basics are covered we will be able to use a full suite of music software to work on improvisations, blues, jazz and much more! Hi, there! My name is Doug Ehlert and I can't wait to meet you! I've been teaching private lessons since 2007 and have loved helping my students learn their chosen instrument! Many of my former students have gone on to become composers, performers and active instructors. I went to UW-Milwaukee and earned a degree in Music (Trumpet and Piano Emphasis) in 2009. I'm a fun and enthusiastic instructor and my teaching style reflects this. I look forward to helping you reach your goals! pit orchestras for a variety of musicals, and more! Whether instructing piano or trumpet, lessons are always interactive, educational, memorable, and most of all fun! The kids love Mr. Ehlert. I am currently a Master's student at Oklahoma State University. Our trumpet studio has a history of excellence in performance, winning several competitions as both soloists and ensemble members. I currently hold a Bachelor's degree in Music Education. I have experience working with beginner, intermediate, and advanced students. I have also worked with some students who have special needs. I am outgoing, friendly, and am excited to help elevate your playing to a new level. out to me if you have any additional questions! in between. He can help you get results." San Bernardino, CA teacher: Phil N.
"Phil is a wonderful trumpet teacher. My son loves trumpet and Phil makes the lessons and practice sessions fun and engaging!" sonable guy and easy to deal with. Teaches from Clarke, Gordon, Pappy Mitchell, & Chas Collin etudes and weaves in his own Bob Valli instructional experiences. After having a triple bypass surgery, I was able to hit E's above high C after about a few months of instruction from Phil. He is also a phenomenal performer and one should always take the time to see him perform at one of his gigs. Loved playing the pop or TV tunes he always gives to his students." good feedback. He is a master of appropriately challenging the student. At times he will play along with me which I find helpful. If I miss a lesson he gives me make up lessons. His rates are more than fair. I highly recommend Phil for trumpet instruction." aying, but who does adult lessons? No one is the answer. I found Phil and he helped me renew my passion for playing. I took lessons in person and then when I moved out of state they continued online. He took me seriously as an adult female trumpet player, but was also a lot of fun to take lessons from. This guy knows trumpet inside out and backwards! He was always patient with me and struggles with my lessons. He helped me work around my busy schedule and life. I don’t care where you live or what past teachers have been like seek this man out and improve your skills tremendously!" rove his embouchure through various lip exercises and slurs. Also, works on diaphragm strength through various exercise. Alex is one of the top trumpet players at his school as a freshman. His range and tone has dramatically improved since working with Phil. Phil is fun and engaging as well. I highly recommend Phil to anyone looking for a competent and skilled music instructor."